As I enter Falconer Salen tonight, I realize that I’m probably not the only one who was overwhelmed by Polly Jean Harvey’s magnificent show at this year’s Roskilde Festival. Taking a wild guess, I’d suppose that people’s age range from late teens to early sixties among tonight’s attendance at this first of two sold-out shows in Copenhagen. As I confine myself in a good spot to get ready for the show, two questions suddenly occur to me: A) How will Falconer Salen contain a band of this size, and B) How will tonight’s set differ from the one at Roskilde three and a half months ago? A naked, dark stage is what we witness as the show begins. From stage left ten people suddenly appear to the sound of marching snare drums. As the brass instruments join in, a large concrete wall appears and transforms itself into a physical manifestation of the impressive wall of sound the band creates through no less than two sets of drums (including bass drums), two to three brass instruments (depending if PJ herself sings or blows into one), two guitars, a bass and two keyboards/synthesizers. Quickly it becomes clear to me that whoever manages tonight’s sound knows what he/she is doing; everything is loud. Really loud. But everything is also crystal clear. Every beat and strum is highly evident, and above all of the instruments lies Harvey’s voice that at the same time appears as both something incredibly beautiful and frail but also insistently powerful. At this point already I get the feeling that tonight, at Falconer Salen’s dark and intimate setting, will be one to remember. 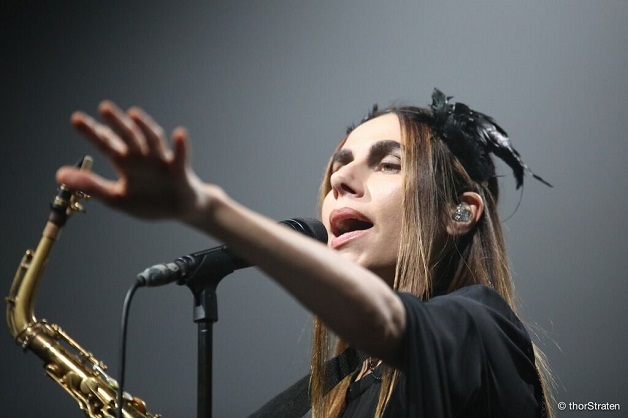 Surely, tonight’s setlist consist of many of the same tracks that were aired earlier this year; PJ Harvey’s last album, “The Hope Six Demolition Project”, was a political outcry against the “HOPE VI” proposition, and it’s the album she’s still touring with. Obviously, lots of political songs from both that record and the one prior to it, “Let England Shake”, are on the agenda. Luckily it detracts nothing from the show as every song still sounds fresh and burns with the same fire they’ve always done. Especially the one-two punch “The Ministry of Defense” and “The Community of Hope” early sets the bar high, and as the iconic keyboard leading into the “Let England Shake” title-track kicks in you can feel it stir up the floor and rumble through the entire room. 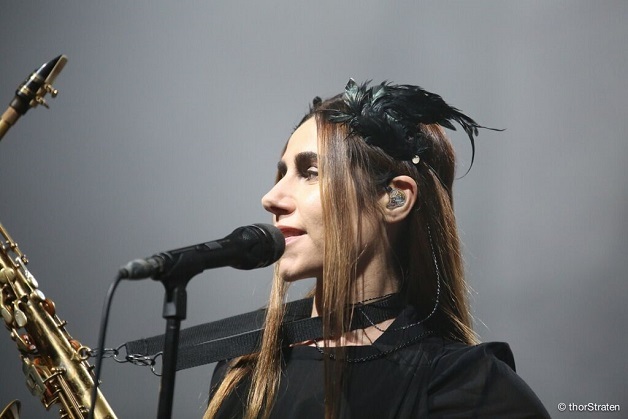 During these first few songs you can hear a few high-pitched voices up front yell “happy birthday, Polly” (as it’s PJ Harvey’s birthday), but not even with a wink, a smile or a nod does she acknowledge the gesture; the show must go on, no time for such follies. 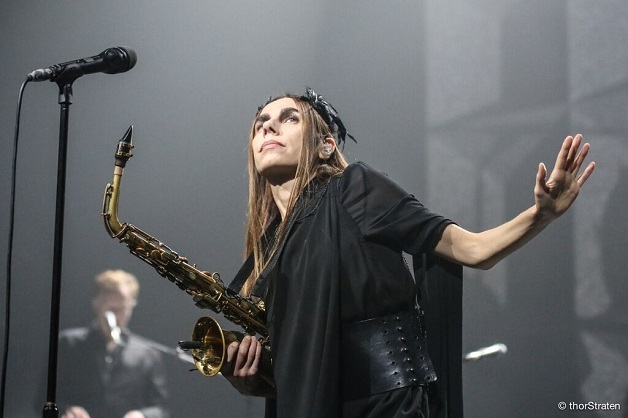 Personally, I think it’s a shame that she chooses to ignore this brief intervention between songs, as it’d add an extra dimension to PJ Harvey’s character and performance, but maybe that’s just me. Alas, the music and performance on-stage is still marvelous, and after the chanting “The Words That Maketh Murder” and a groovy, slithering “The Glorious Land”, we enter some more quiet and intimate songs from the album “White Chalk” which lets the audience breath for a few minutes. But only for so long are we able to dwell in trance before an absolutely crushing performance of “The Ministry of Social Affairs” tears us into pieces. The percussionists synchronize more perfectly with each other than I can remember anyone ever do, the guitars subtly strum along, the brass ensemble creates a thick, murky sound that builds the song’s foundation, and suddenly, during the last few minutes of the track, Terry Edwards pulls out a white saxophone and performs an ear-shattering solo that still leaves me in total ecstasy just thinking about it. 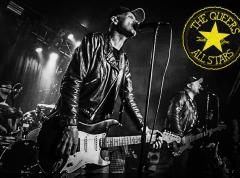 From here things only get even more out of control: “50ft Queenie” sees the entire band create dirty, grungy punk-madness as the show reaches a point where the entire stage almost boils over in a huge cathartic explosion. Nothing, however, could prepare me for the majestic rendition of “To Bring You My Love” that follows. John Parish takes the steering wheel as he plays the slow, filthy stoner guitar riff that represent the song while Polly Jean herself progressively sings louder through every verse. The mastodontic stone wall behind her is lit up by an amazing red/orange glow that almost makes the setting appear like the fiery forecourt of hell itself, and as she screams ”To bring you my love” you can truly feel her craving and utter despair. Fittingly, the next song “River Anacostia” feels like a continuation as the large wall suddenly disappears behind the stage, slowly descending below the floor. Afterwards, the band bows and waves goodbye, leaving the crowd in a total frenzy. I don’t know how long it takes for the band to get back on stage as I, too, was too busy applauding the band, but at least five or six minutes must have passed during which the audience constantly has been cheering. The show ends on a high as PJ Harvey and the band surprisingly chooses to perform an alternative cover to Bob Dylan’s classic “Highway 61 Revisited” (known from Harvey’s album “Rid of Me” from 1993). The song is performed with exceptional energy and sees Harvey change her stance on-stage from a slow, mystic goddess to a manic, rapid tempest that exuviates the very essence of the Dylan-classic itself: ”God said to Abraham: ‘kill me a son’ // Abe said ‘man, you must be puttin’ me on’ // God said ‘no’, Abe said ‘what?’ (…)” If there ever was any doubt about PJ Harvey’s prowess as a live performer, it was all laid to rest tonight. If you left disappointed, you have only yourself to blame. Polly Jean Harvey is as professional as they come, and tonight cements her status as one of the greatest live artists around today.